Hunter Pence hit a walk-off sacrifice fly in the tenth inning, giving the Giants a 4-3 victory over the Dodgers. Christian Arroyo hit a two-run home run, his first of his career, and Michael Morse hit his first home run of the year, in a late rally by the Giants. Game three of the series between the Dodgers and the Giants looked like a pitcher’s duel after the fifth inning ended. Johnny Cueto had allowed only three hits and Alex Wood had allowed only one hit. Things changed in the top the sixth inning with Corey Seager at the plate. Seager worked the count full, then, Cueto threw him a fastball right down the middle of the plate. The ball left Seager’s bat at 108.9 mph with a launch angle of 26 degrees. I’m sure what you can guess happened, Seager hit the ball over the outfield wall. The ball traveled a projected 463 feet according to Statcast. Later in the inning, Chase Utley came to the plate with the bases loaded and one out. Utley has not had a hot start this year but was able to bloop a single into center field and pick up an RBI. It was his second hit of the year and first RBI. Hopefully, this single will finally get Utley going this year. Andrew Toles has been struggling for the past week or two, but he was able to pick up an RBI on Wednesday night. With the bases still loaded, Toles hit a groundball to shortstop. Only his speed kept the Giants from turning a double play and allowed the run to score. The Dodgers took a 3-0 lead. 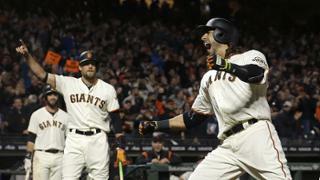 The Giants tied the game in the eighth inning on a solo home run by Michael Morse. Morse had just been called up from Triple-A for the second time this year. Morse was pinch-hitting and worked the count 1-2 against Pedro Báez. Yasmani Grandal called for a fastball up and Morse hammered it over the wall in left-center field. The bottom of the tenth inning was trouble for Ross Stripling. Gorkys Hernandez led-off with a single, then Conor Gillaspie walked. Nick Hundley tried to hit a sacrifice bunt, but the Dodgers instead attempted to get the lead runner, Hernandez, out. He made it to third base safely, and the Giants had the bases loaded with no outs. Pence came to the plate, and, after a ten-pitch at-bat, hit the ball high and deep to left field. Cody Bellinger caught the ball but his throw was not in time to get Hernandez out and the Giants won the game 4-3. Christian Arroyo hit his first Major League home run off of Sergio Romo on Wednesday. Arroyo thought that his hit was a double, so he was sprinting around the bases. What he did not know when he stepped out of the batter’s box, is that he had just hit a two-run home run. The homer brought the Giants back in the game and changed the momentum. Julio Uriás will finally make his first start of the 2017 season for the Dodgers. Matt Moore will start for the Giants, who are hoping to win the series. The game will start at 12:45 pm PT. and be televised on SportsNet LA.